18th-century French calf, gold-tooled panel design with fleuron stamp at corners, fillets on spine, rebacked. 139 leaves (1 column, 13 lines (fols. 1-115) and 15 lines (fols. 116-139), bound : vellum, ill. ; 165 x 111 mm. Henri-Auguste Brölemann of Lyon, ca. 1850 (bookplate on front pastedown); Madame Etienne Mallet ( Brölemann 's great granddaughter); her sale (London, Sotheby's, 4 May 1926, lot 38) to Edwards; purchased by Julia Parker Wightman from Harry A. Levinson, Beverly Hills, CA, in 1951; JPW 1447; given in April, 1993. 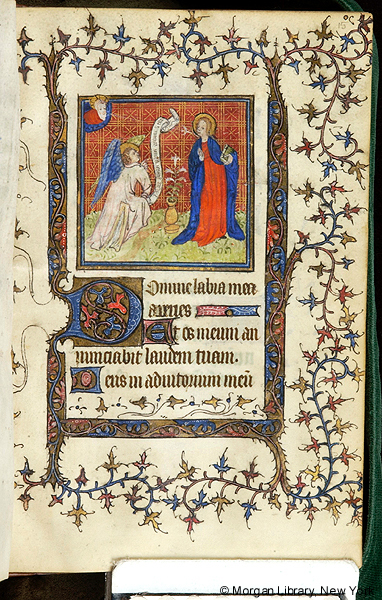 Ms. book of hours, use of Paris (Hours of the Virgin, Office of the Dead), written and illuminated in Paris, France, ca. 1390s (fols. 1-115) and ca. 1470 (fols. 116-139). Decoration: 8 half-page miniatures, one added ca. 1470. Artist: Workshop of Maître François for the added miniature on fol. 135.